Are you looking for exceptionally fast swings and tremendous smashes with your racket? You can bet on this model to achieve them. Because I will show you by Yonex Nanoray Z Speed Review. This model comes with impressive features that will help you deliver a stunning performance. The agility and power of shots you get from it are awesome, plus you can play with it for long hours without feeling fatigued. The lightweight nature of this product is as a result of the technology used to make it. The racket features carbon nanoparticles bonded with fullerene for extra strength. This technology makes the racket light enough to allow you to control it with ease. It reduces hand fatigue since you are not swinging a heavy object that would strain your muscles. 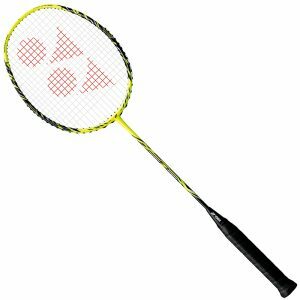 The construction also makes the racket robust, durable and hi-flex. As a result, the response time you achieve with it is reduced and your repulsions become instant and more powerful. The racket features a sweet spot large enough to help you achieve higher accuracy with your hits. The large sweet spot is made possible by using an isometric design in the racket’s frame. The design allows the strings to be strung in a way that they’re equally distanced from each other; the main and the cross strings. This feature will benefit you a lot if you’re a beginner. Because you’re yet to master hitting the shuttlecock the with more accuracy, you need a frame with a large sweet spot to help streamline even the off-center shots. If you don’t want a racket that will develop a wobble after using it for some time, you should get the Nanoray Z Speed. This racket features a T-joint construction to connect the shaft to the main frame. With this kind of construction, you can rest assured that the racket will remain firm and allow you to use it for a long time. The T-joint also makes the racket to be stiff enough to produce powerful smashes as well as instant repulsions loaded with power. The ability of a racket to produce powerful shots and deliver excellently clears lies, to a higher degree, on the structure of its shaft. This racquet comes with a thin long and lightweight shaft. It provides more leverage to give power to your hits without having to use too much force. The Nanoscience construction used in the shaft’s structure allows it just the right level of flexibility powerful instant and powerful repulsions. One disadvantage with this product – but one you may not find a big concern is its lightweight design. It forces you to use more effort to give extra power to your smashes, especially if you’re involved in a competitive game. If you’re using the racket for casual play, whether for entertainment or practice, this shouldn’t be an issue. This is a great racket to use to build your badminton skills. It’s lightweight enough to allow you speed and improved maneuverability. It also allows you greater accuracy in your shots than standard rackets. Buy Nanoray Z Speed today to experience the excellence it brings in your game of badminton. You can find out the factors to choose the racquet that best suits you here.